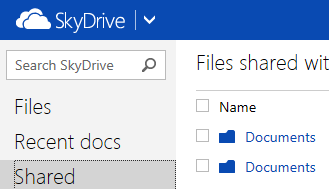 The new app to have access to your OneDrive (formerly known as SkyDrive) files locally and offline is great and super easy to use but it does not replaces Live Mesh when you want to share and have access from Windows Explorer files and folders. 2. Click on the “files” link or if you want to see a shared folder the folder you want to access from Windows Explorer. Option A) while on “Computer”, click on “map network drive” (e.g. by right-clicking on “Computer” and selecting the menu item corresponding). You can also use “map network address” if you don’t want to associate this to an actual drive letter. This has the advantage of avoiding sometime annoying “cannot reconnect drive” messages at boot-up. “reconnect at logon” ensure it remains connected when you reboot. That’s it! And you can map as many of those as you want. 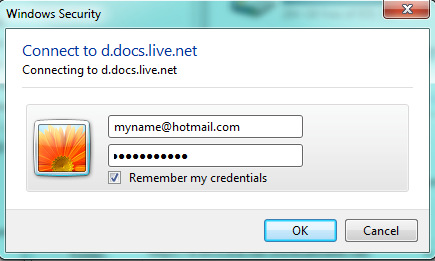 Enter the following address in the address bar \\d.docs.live.net@SSL\DavWWWRoot\CIDBUMBER (no need to worry about caps/nocaps in this case). Note: with Option A) using “mapping to drive letter” you can then use the free SyncToy tool to synchronize the files on this cloud folder and your PC. This entry was posted in Computers and Internet on February 7, 2013 by Olivier. How is the average user supposed to figure this out? There needs to be an easier way to locally access files that other people shared with you. Not that I know of. You can always retrieve them from the browser, SkyDrive has a menu on the left “shared” that shows all shared folders but there is no -to my knowledge- easy way to do this. Another interesting point is that if you run the latest version of Office (2013), SkyDrive support is natively supported. If you go to the ” open” menu you will see your SkyDrive as well as the shared docs, xls, ppt and OneNotes folders straight from the app. Another tip is that the CID is in the email address if you receive a shared invite. For example, if someone shares a folder with you, you should receive an email with a from address similar to outlook_3f830f76abab8452@outlook.com on behalf of (sender’s name/address). The number is the same CID that you find in the webpage address bar mentioned above. Also: See acknowledgements. Thanks again! Olivier, thank you so much. This is exactly what I was looking for. I wish the Microsoft forum mods would direct people to your post instead of providing the internal link to “feature requests”. Your approach is the perfect solution to the question how to add shared OneDrive folders to Windows Explorer. Did you set-up two-factors authentication on your account? If yes you need to get a unique app-password en enter it there. It worked for me. Hum. I’m a bit at a loss then. Maybe you use different MSA (aka LiveID) on the same account (e.g. switching outlook.com inboxes) and you need to re-enter it because of this? If not his I am sorry but I really have no idea why. We both use normal email accounts, so it shouldn’t be an issue. One thing I recently discovered: apparently MS doesn’t offer this service at all anymore? (Like to map a OneDrive account…). But I don’t know, could be the reason why it isn’t working anymore. Then again I wouldn’t understand why to ‘step back’ as there is probably no better way to use online storage than a mapped (network) drive (that doesn’t even need to claim local disk space)… ?! FYI I just tried and it works on my end. Not as as a mapped drive, just as a network folder by opening windows explorer and typing \\d.docs.live.net@SSL\DavWWWRootE…. Olivier, the method you described worked … sort of, but not exactly. I am trying to use it to map a drive on my daughter’s computer, so she can access a folder we’ve shared with her from our OneDrive. I clicked on the Shared folder from my OneDrive, got the CiD number, and mapped it on my daughter’s computer, like described above. But, instead of mapping to the actual shared folder, it is mapping to the Public directory from my OneDrive, and I can see all the files that are in that folder. Any thoughts? Hum. Interesting. Besides maybe the link reverting to public if you did not enter the right password (and I’m totally conjecturing here) I really have not idea. Sorry. Yes, same issue for me. Following both methods, only brings me access to an empty public folder. Thank you for figuring this stuff out. I used the method you shared about two months ago, and it worked! I no longer needed access to that particular shared folder and deleted the mapped access. A week ago another occasion arose where I am frequently using a folder that has been shared to me. I have followed the steps again, several times with no success. Today is 2/12/15, has Microsoft blocked this end around, or has something changed? Your advice is eagerly awaited. I’ve been trying this win Win7 and 2012 server to use it as a backup solution. I can map a drive in win7 using this procedure but can’t seem to use the built in windows backup to backup to it, the network location is available but the OK button to use this as a backup location is greyed out. I can’t get it to work on 2012 server at all, I’m looking to use this as an offsite backup solution for a customer. Has Microsoft made any changes to their security settings? I have multiple shared folders across different Onedrives shared to me, and I was able to logon to each of them using file shortcuts, or by pasting the address into explorer, as long as I had logged into one network drive. Now the only way I can access the shared folders is by making a network drive for each folder. Just did this on Win 10 build 10240 with great success! thanks now I can actually make use of all my cloud storage without needing to keep files on my HDD. Anyone ever tried to map shared resource(someone did a share of files with me, for example) to the network drive? 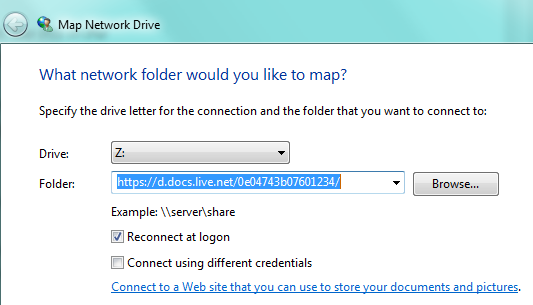 Whenever I pass the url(https://d.docs.live.net/SHARED_RESOURCE_CID) it keeps saying that network location does not seem to be valid. I cannot seem to find the CID. My URL looks nothing like that. I don’t even have a Files link; mine says Documents. Please help! Hi is there anyway to secure your OneDrive Files in the File Explorer? If not then how is it secure on your PC? Anyone can just sit down at your PC and open your OneDrive files by the file explorer or any microsoft document? Anyone else noticed this?